Because, yup. 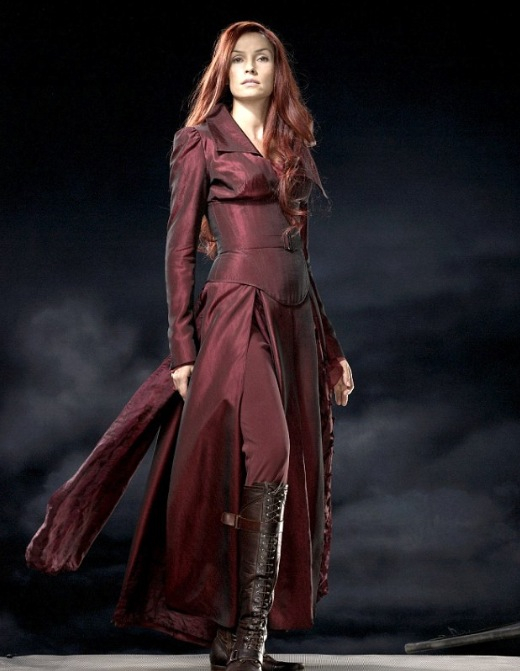 It’s basically a more dressed-down version of Famke Janssen’s Phoenix attire in X3. The coat’s the main thing it borrows, given this Jean’s rocking a more casual t-shirt-and-jeans to go with it, but still! It’s a nice throwback to Last Stand, even if it does kind of feel like a weird reminder that this X-Men prequel saga and the earlier films are meant to be part of their own bizarre, nigh-on-incomprehensible timeline. But it’s kind of a shame that the comics-costumes for the X-Men aren’t being accompanied by a take on Phoenix’s costume, too. These movies are finally getting around to putting non-Magneto mutants in comics uniforms and they’re not using one of Jean’s most iconic looks! That, and when people are desperately hoping for a take on the Dark Phoenix Saga that isn’t as universally derided as X3 was, it’s a bold move for Dark Phoenix to remind us of it in such a big way. We’ll have to wait until tomorrow night, and then eventually June 7, to see if a comics inspiration and a nice red coat are all that Dark Phoenix is going to end up borrowing from Last Stand.